A few weeks ago, scientists from the SETI Institute (Search For Extraterrestrial Intelligence) told the United States Congress that extraterrestrial life most certainly exists. Now, we might not be too far from seeing it for ourselves. Scientists have found and identified many Earth like planets, the next step is building a craft that is capable of travelling faster than the speed of light so we can go take a look. One of the biggest arguments against extraterrestrial visitation today is the fact that light speed travel is not possible. This isn’t only untrue, but there are multiple ways a craft could travel throughout the universe in short periods of time. There are shortcuts through space, wormholes, bending space, the Alcubierre Drive and more. 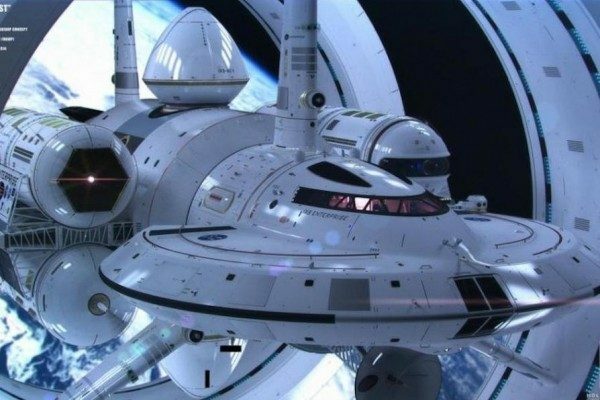 Believe it or not, NASA is already working on the first tactical field test toward the possibility of faster than light travel. One solution they are thinking about would be to place a craft within a space that is moving faster than the speed of light. (source) Therefore the craft itself does not have to travel at the speed of light from its own type of propulsion system. Just think of a flat escalator in an airport. The escalator moves faster than you are walking. In this case, the space encompassing the ship would be moving faster than the ship could fly, keeping all of the matter of the ship together and intact. This is called the Alcubierre Drive. This type of concept was also recently illustrated by Mathematician James Hill and Barry Cox at the University of Adelaide. They published a paper in the journal proceedings of the Royal Society A: Mathematical and Physical Sciences (source). Have We Already Built Those Crafts? Have We Already Explored Areas We Are Not Told Of? Some reading this might instantly shrug their head and say “here we go with the conspiracy,” but if you do a little research and investigation, you will see that this is far from a conspiracy. Not long ago Edward Snowden, a former intelligence contractor, leaked the very first documentation that proved the existence of clandestine black budget operations. You can read more about that HERE. These are Special Access Programs (SAP). They don’t exist publicly and are better known as ‘deep black programs.’ A 1997 US Senate report decried them as “so sensitive that they are exempt from standard reporting requirements to the Congress.” (source) The government does not even have access to these programs. Here is a statement from Paul Hellyer commenting on these programs. We live in a world of secrecy. The U.S government classifies hundreds of millions of pages worth of documents every single year. For someone wanting to preserve and study American history, how is somebody supposed to do that if many events and discoveries of significance remain hidden? Could UFOs be a part of these programs? Again, no conspiracy here, UFOs are a verified fact, dozens of governments have openly admitted to this. It’s quite the phenomenon. To see what happens when a “UFO” is tracked on military radar, click HERE. The evidence ranges from documents, to video footage, to statements by government, military and political personnel from all over the world, including personal encounters of people all over the world. I am not going to do your research for you. It’s out there if you really want to find it. Everything the human race defines as evidence exists with regards to UFOs. READ 2014: This New Battery Can Charge Phones & Electric Cars In Minutes! I think it’s also noteworthy to mention that not long ago, US Army, Navy, Air Force and Department of Defence computers, as well as 16 NASA computers were hacked in what was said to be the biggest military hack of all time. The hacker found lists of non-terrestrial off-world officers and multiple pictures of UFOs and transfer of materials from ship to ship. You can read more about that HERE. Again, we live in a world of secrecy. It’s a documented fact that there is a breakaway civilization here that has accomplished feats the mainstream world can’t even imagine. Authorities have always operated in secrecy, the NSA was founded in 1952 but its existence was hidden for more than a decade. Even more secretive is the National Reconnaissance Office, which was founded in 1960 but remained completely secret for 30 years. You can read more about the breakaway civilization HERE. I hope this article has given you something to think about. It would be great if our world could be totally transparent. We don’t need to keep secrets, and we can live here together, helping each other and loving each other. There is no need for “national security,” a world of chaos is needed to maintain the current system, a world of love breaks it apart and renders it useless. EXOPOLITICAL DISCLOSURE: Citizens Hearing On Disclosure Or Alien Deception Agenda – Campaign For Extraterrestrial Disclosure Underway? !